The Steamship Historical Society of America, Inc. Without question America's greatest river, the mighty Mississippi begins as a small creek that rushes out of Lake Itasca in northwestern Minnesota and continues on a journey of 2,350 miles to the Gulf of Mexico. She is the third largest river in the world, and continues to be a focal point of commerce, trade and tourism. The Port of New Orleans is at the center of the world's busiest port complex - Louisiana's Lower Mississippi River. Come join us for a weekend of fascinating lectures, nautical excursions, and some great food and music at the 'Big Easy' . . . New Orleans, Louisiana. Although this event is being presented by the Steamship Historical Society, all are welcome to participate. 4:30-6:30 pm - Registration at the Chateau LeMoyne Hotel, 301 Rue Dauphine, New Orleans. Pick up your meeting packets at this time. 6:30-8:30 pm - Wine and cheese 'Welcome Reception' at the Chateau LeMoyne Hotel. Guest speaker TBA. 9:00-11:00 am - Continued registration at the Chateau LeMoyne Hotel. Savor the beauty and romance of New Orleans on the two hour cruise from the heart of the French Quarter on New Orleans' only steamboat,the Natchez. See one of the world's most active ports as you journey back in time. The Natchez is a genuine steam powered vessel, with an open engine room for you to explore. A New Orleans style lunch buffet and cash bar are offered onboard (not included in voyage ticket). 1:30-2:30 pm - One hour for lunch/shopping on your own. 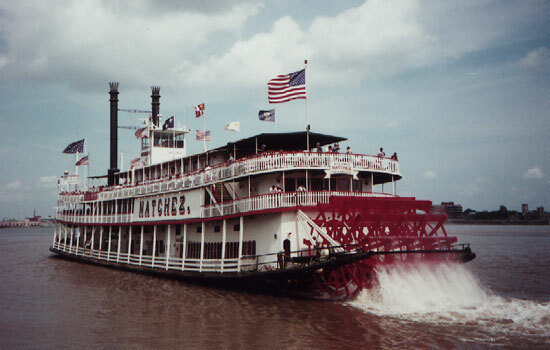 2:30-4:30 pm - Board buses (at the Steamboat Natchez Docks) for a narrated tour of the City of New Orleans. Absorb the sights and sounds of the famous French Quarter and historic Jackson Square, home of the Cabildo and Presbytere Museums. Listen as your tour guide points out the landmarks and splendid architecture that made New Orleans famous. Walk through St. Louis Cemetery #3, one of our unusual "Cities of the Dead" (cemeteries), and learn about this unique above-ground burial system. 6:00-7:30 pm - Social hour (cash bar) with swap & sell tables at the Chateau LeMoyne. Come meet your fellow members and examine the memorabilia at the swap & sell tables. Tables are available to members for a small fee (see reservation form). After Dinner - Slide presentation and talk by Captain Doc Hawley. Doc will present "Steamboating 101", a pictorial history of steamboating on the Mississippi River. Of the six remaining steamboats on the Mississippi system, Capt. Hawley has commanded or piloted five of the six. Serving as a modern day steamboating public relations man & goodwill ambassador, Capt. Hawley has hosted US Presidents, government officials, royalty, entertainment & sports stars, river buffs and countless media people. The Steamship Historical Society wishes to thank the Delta Queen Steamboat Company for the use of their slide projector and screen for the evening's presentation. The remainder of the day is open for you to enjoy on your own. We have reserved a block of rooms at the Chateau LeMoyne Hotel for Friday & Saturday nights at a special rate of $139.00 for a single or double. The Chateau LeMoyne is owned and operated by Holiday Inn. Consisting of four Greek Revival townhouses built in the 1840's and lovingly restored to their original grace and grandeur, the Chateau LeMoyne pampers its guests with period furniture echoing the tastes of wealthy merchants and aristocrats of years ago. The Chateau LeMoyne has every amenity from a heated swimming pool to room service. Guests can relax in the comfortable lounge, enjoy a live New Orleans jazz combo on weekends, or enjoy romantic courtyard dining with Sclafani's tantalizing Creole Italian dishes. Parking is available for hotel guests and visitors. Hotel reservations can be made by calling 800-747-3279. You must book the hotel on your own, but be sure to mention the Steamship Historical Society to get the special rate. Reservations must be made by August 31, 2002. For other hotels in the area, contact your travel agent. By Air: Louis Armstrong International Airport is served by most major airlines. Call your travel agent for more information. From the airport to the hotel, taxi's are $24.00 flat rate for up to two people, or you can take the Airport Shuttle at $10 per person. Transportation options are located near baggage claim. By Bus & Train: New Orleans is served by Greyhound and Amtrak, with the terminal located at 1001 Loyola Ave. Contact your travel agent for more details. Contact United Cab (telephone 504-522-9771) for the short ride from the terminal to the hotel. By Car: From I-10 East, exit 235A, at light left on Orleans Ave, left on Conti, right on Dauphine. From I-10 West, Exit 235A, left on Conti, right on Dauphine.